Deep in the jungle, several bodies have been discovered skinned and hanging from trees - although who or what could have done this is a mystery. Military covert specialist Dutch (Arnold Schwarzenegger) and his team are called in to eliminate the threat, but once in the heart of the menacing jungle, they discover something far worse than they could ever have imagined - the Predator - an alien which has come to Earth with cloaking technol.. Predator Deep in the jungle, several bodies have been discovered skinned and hanging from trees - although who or what could have done this is a mystery. Military covert specialist Dutch (Arnold Schwarzenegger) and his team are called in to eliminate the threat, but once in the heart of the menacing jungle, they discover something far worse than they could ever have imagined - the Predator - an alien which has come to Earth with cloakin.. This electrifying action sequel unleashes the deadly invisible Predator in another jungle the urban jungle of Los Angeles. Danny Glover stars as a hard-headed cop up against a savage alien who has come to Earth from a distant galaxy to hunt humans for sport. Special Features Audio Commentary By Director Stephen Hopkins, Audio Commentary By Writers Jim Thomas & John Thomas, The Hunters & The Hunted, 3 Evolutions Segments, 6 Weapons Of C.. This electrifying action sequel unleashes the deadly invisible Predator in another jungle - the urban jungle of Los Angeles. Danny Glover stars as a lieutenant who mistakenly concludes that mangled bodies found by the police are the work of feuding gangs. Instead, he finds himself confronting a savage alien who has come from a distant world to hunt humans for sport. Gary Busey and Ruben Blades co-star in this suspense-packed, high-tech ..
Arnold Schwarzenegger stars in this action-packed adventure story of fighting men pitted against an unseen enemy, a force more powerful than their fiercest weapons. Recruited by the CIA to rescue hostages held by guerrilla fighters in a Central American country, Schwarzenegger and his men encounter an enemy unimaginably more deadly than any on Earth - because the Predator is not of the Earth. Packed with spectacular effects and combat s..
Own Predator Trilogy 4K Ultra HD + Blu-Ray from Deff, DVD, Blu-Ray & 4K Video Specialists - Free UK Delivery.. Predator Arnold Schwarzenegger plays Dutch who wages an all-out war against an unseen enemy! When a crack team of commandos undertakes a covert mission in Central America, they have no way of knowing they've wandered into the hunting ground of a creature more powerful than even their fiercest weapons. As they are picked off one by one, Dutch races against time to defeat an undefeatable enemy! Predator 2 As a heat wave engulfs the city .. Predator: Arnold Schwarzenegger stars in this action-packed adventure story of fighting men pitted against an unseen enemy, a force more powerful than their fiercest weapons. Recruited by the CIA to rescue hostages held by guerrilla fighters in a Central American country, Schwarzenegger and his men encounter an enemy unimaginably more deadly than any on Earth - because the Predator is not of this Earth. 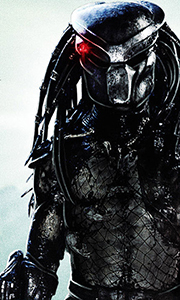 Packed with spectacular effects a..
Robert Rodriguez presents Predators, a bold new chapter in the Predator universe. Adrien Brody stars as Royce, a mercenary who reluctantly leads a group of elite warriors in a mysterious mission on a alien planet. Except for a disgraced physician, they are all cold-blooded killers - mercenaries, mobsters, convicts and death squad members - human "predators." But when they begin to be systematically hunted and eliminated by an unimaginab.. Experience 4 times the terror with this 4-film collection! In Predator, Arnold Schwarzenegger battles an unseen enemy, and in Predator 2, Danny Glover fights the creature in Los Angeles. In Predators, Adrien Brody faces a new Predator breed on an alien planet. Finally, Boyd Holbrook discovers that the most lethal hunters in the universe are stronger, smarter and deadlier than ever in The Predator!.. The hunt has evolved — and so has the explosive action — in the terrifying next chapter of the Predator series from director Shane Black (Iron Man 3). Now, the most lethal hunters in the universe have been genetically upgraded to be stronger, smarter and deadlier than ever before...and only a ragtag crew of ex-soldiers and an evolutionary biology professor can prevent the end of the human race!.. Own Predator 4K Ultra HD + Blu-Ray from Deff, DVD, Blu-Ray & 4K Video Specialists - Free UK Delivery..
Own Predator DVD from Deff, DVD, Blu-Ray & 4K Video Specialists - Free UK Delivery..
Own Predator Ultimate Edition Blu-Ray from Deff, DVD, Blu-Ray & 4K Video Specialists - Free UK Delivery..